In recognition of Canada Water Week, Ontario’s Conservation Authorities are launching a series of Watershed Report Cards that provide us with a picture on the health of a number of Ontario watersheds. More than a dozen are available today on the website with more to come throughout this year. Conservation Authorities, in partnership with other agencies, collect a wide variety of water and environmental data and, while most Conservation Authorities have issued reports on watershed conditions before, this is the first time that report cards have used standardized analysis and reporting methods. This will allow Ontario residents to get a province wide picture of the health of our watersheds. The responsibility for managing watershed natural resources is shared by many organizations including provincial ministries, municipalities, citizens groups, watershed residents as well as the Conservation Authorities themselves. These report cards provide insight into how we are collectively doing using three resource categories: surface water quality, forest conditions and groundwater quality. The grades of the first batch of report cards are sobering. While there are some As and Bs there are also a lot of Ds and Cs, primarily in areas of intensive land use such as the Greater Toronto area or in areas with extensive agriculture. This is to be expected since we know that intensive land use has a significant impact on our rivers and natural areas. One of the biggest threats we need to tackle is storm water runoff in both urban and rural areas, which can carry pollutants into rivers and lakes and cause erosion and flooding. We also need to do a better job of protecting and restoring natural areas. The good news is we know what the solutions are. 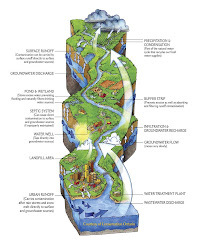 To start with we can do more watershed planning, monitoring and reporting to identify specific problems and target the most effective solutions. In urban areas we can be smarter in how we develop land by implementing Low Impact Development which prevents storm water runoff and instead, keeps water on the landscape and cycling through the water cycle. Storm water runoff is polluting rivers, creeks and streams, and ultimately impacting the Great Lakes. In rural areas farmers and other landowners, with the help of various agencies, are implementing stewardship practices that reduce impacts, and with additional support they can do more. Why should this matter to you? A healthy watershed provides us with safe drinking water, clean air, access to green areas and outdoor activities, and provides a foundation for a good part of Ontario’s economy. Healthy ecosystems and biodiversity build local watershed resilience, promoting healthier Great Lakes and helping us adapt to one of the biggest and growing challenges we face – climate change. While these Watershed Report Cards provide a snapshot of how we are doing now, their real value will come in the future when subsequent report cards will allow us to compare trends over time to find out how effective our efforts are. In the meantime, take the opportunity to explore these reports cards to learn about your local watershed and then talk to your local Conservation Authority. If you happen to live in an A or B watershed the Conservation Authority can give you ideas on how you can keep it that way. If it’s a C or a D, don’t worry, they can tell you what you can do to help improve the grade next time.